I’ve gone back to the basics and thought it was time to explain what Fodmaps are. The word Fodmap is an acronym for fermentable, oligosaccharides, disaccharides, monosaccharides and polyols. I’ve made a video explaining what they are and I have added a few statistics too. Welcome to this video. Today I want to explain what FODMAPs are and give you a few stats at the end of the video. FODMAPs is the letters of the word. F is fermentable for what goes on in the gut when the carbohydrates are broken down. The O is for oligosaccharides, which includes the galacto-oligosaccharides, which are the pulses and the legumes. The other oligosaccharides – the fructans – can be in wheat, barley and rye, onion and garlic, and so on. We’re up to the D in FODMAPs, that’s the disaccharides. That’s lactose, so obviously in milk, cream, and cheese. The M is for monosaccharides, and that’s the fructose which is in most vegetables and fruit. The FODMAPs, the A, is for and. The P at the end of the word is for polyols.The polyols are sorbitol, and mannitol, and they can be in some fruits and vegetables and in other places as well. So that’s the explanation of the word FODMAPs. It is the carbohydrates in food, and our problem is that we don’t absorb high level of FODMAPs through the lining of the small intestine, so they go on down to the large intestine where they get fermented by the bacteria there, and that causes a lot of our issues. So, if you have IBS and you can control the number of high FODMAP foods that go into your body, you’re going to be controlling the symptoms. Now, just for a few stats. 12% to 15% of the population globally have Irritable Bowel Syndrome. So, that means if you are sitting in a room of 100 people,12 to 15 of those are going to have the same issues as you. But because it’s a silent affliction which we don’t really talk about, we are not going to know that. So why don’t you be the first one to start talking about it, and then you’d be really surprised at how others start to open about it. 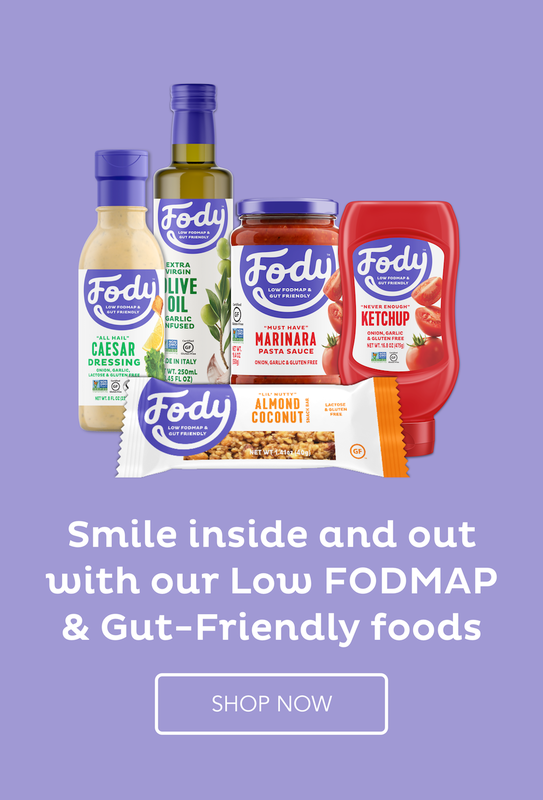 The more it’s known out there, and the more it is known that there is a solution for keeping the symptoms under control – the low FODMAP diet – the better for everybody. With the FODMAPs themselves, only 25% of people who have a FODMAP problem, have a lactose problem. That means 75% of people with a FODMAP issue don’t have an issue with lactose. 45% have a problem with fructose, which means 55% don’t. So you’d be able to eat the foods with fructose in them as long as they didn’t have any other FODMAPs in them. The polyols, 57% can’t absorb sorbitol, but 20% with mannitol, that means 80% of you with a FODMAP problem can eat the foods that have got mannitol in them, again, as long as they don’t have any other FODMAPs in them. So, that’s the different FODMAPs, but the ones that we can never absorb – and they’re also difficult to digest for other people in the population, not just people with IBS – are the oligosaccharides, including the galacto-oligosaccharides. It means things like onion and garlic are probably things that you’re never going to be able to eat, unfortunately. They are poorly digested by everybody in the population. But people who don’t have irritable bowel syndrome don’t really register it as a big problem. They might have a bit ofa tummy rumble and a little bit of gas and they get on with their lives. But for us, because we’ve got the gut to brain communication problem, our guts register it– well, our brain registers it as pain. The bloating is caused by the fact that FODMAPs are not being absorbed. But the reaction to the gas that’s created is more acute in us with irritable bowel syndrome. Galacto-oligosaccharides – beans and legumes, pulses – are poorly absorbed by everybody as well. I mean, all you have to do is think about anybody who has a whole plate of baked beans. They’re going to have some issues with gas afterwards. But for us, that’s disastrous. That level of gas is going to cause a lot of pain for us. Interestingly enough, we can eat small quantities of canned lentils, and canned chick peas but in a very small quantities. So, you could throw those in with something else to make a more complex dish, and then you’re getting the nutrients from those chickpeas, and the lentils. But keep them at very small amounts or you will have a reaction. All right, that’s my information for today. Thank you very much for listening, and goodbye. Once again I have found a recipe from my little green book and have converted it to low Fodmap. This is a Hungarian goulash - a very simple stew to make. When we were in Hungary a few years back, we had a genuine one and it was pretty good but this is not far off in taste. Melt a knob of butter with a little oil in a saucepan. Brown the meat in the pot. Add the spring onions and cook a little. Add the paprika, salt and tomatoes. Add half a glass of water and boil for 1.5 hours. Chop up the potatoes and add to the saucepan with a glass of water. Cook until the potatoes are cooked through and the liquid reduced. It is a very simple goulash and yet it makes a very tasty meal. Sometimes simple ingredients work the best.